Being afraid of the dark is probably the very first thing we’re afraid of as children. It’s a pretty all-encompassing fear since it basically just boils down to fear of the unknown. Walking alone at night can conjure up any manner of evil lurking in the shadows of streets you would have no problem walking down during the day. The hum of streetlights in place of the hustle and bustle of the day doesn’t help, muffling the quieter sounds you strain to hear. Distant machinery and equipment grind and creak as they work on unseen projects. You’re left with the chilling thought that, if someone or something wanted to do you harm, you’d never see them coming. Nobody would see you go, either. You’d simply step into the shadows, and never come out again. 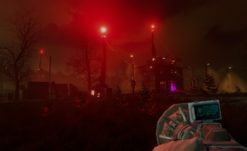 This feeling of ambient dread of the dark is what drives The Light Keeps Us Safe, a new procedurally generated indie horror game just released on Steam. 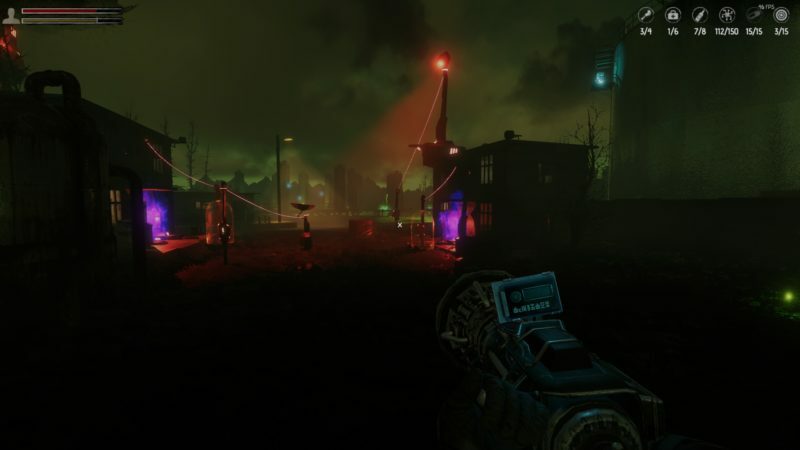 Long after some terrible evil snuffed the sun out, and the relative safety of our underground bunker is collapsing around us, we are forced to explore a dark nighttime hellscape in order to survive. The darkness is our enemy, crawling with strange and calculating machines that hunt for us in the cover of night. Equipped with little more than a fancy flashlight, our night has only just begun, and it might be prudent to gather yourself before venturing out into this nocturnal world. I’ve gathered some helpful tips and information that could guide you on your way to survival in the same spirit as my RE2 classic starter guide, but be warned – the night is darkest before the dawn, and dawn isn’t coming. Not anymore. Your only real “weapon” in The Light Keeps Us Safe is a large multi-function modular flashlight. While light cannot “kill” the machines, it can stun them for just enough time to slip past, and using that to your advantage is key. 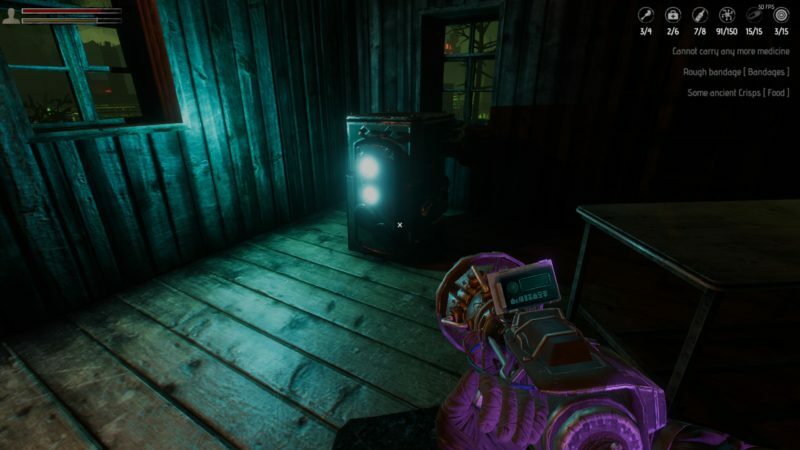 If you’re familiar with horror games then you will probably feel right at home with this mechanic, calling back to similar light-based strategies in games like Alan Wake and the original ObsCure. Your flashlight can be equipped with multiple modes that can be used both to keep you safe, but also solve puzzles and reveal hidden paths. It can also be used as… you know, a flashlight, but be warned that while the battery drain isn’t Outlast kind of fast, you can’t keep spare power on you. You’ll need to trek back to the bunker entrance in order to recharge it, and that is a slow, terrifying journey through the darkness. On top of that, it’s important to know your strengths against each enemy, rather than being caught unequipped. I won’t be detailing every enemy The Light Keeps Us Safe has to offer, as there are many more surprises out there in the darkness, but it’s good to start with a few of the basics. It can be better to know what you can and cannot fight before charging out into the night. It should be noted that the developers have left these sinister machines deliberately vague – both in origin and identity. That being said, they have no official names, and I’ll be listing them by nicknames I’ve given them. You’ll figure out which ones I mean pretty quickly upon seeing them in person. Daleks: these small, trash-can looking guys are unassuming enough to look at, especially since they’re entirely stationary, but stepping into a cluster of them will drain your health fast. Like most of the machines, it attacks with electrical bolts that zap out at you. A quick flick of the light will make them docile for a few seconds, and this process is instantaneous, but still be on your guard. Floating Eyes: These creepy things patrol on their lonesome, but are hard to shake if they give chase. They search with a glowing spotlight eye, so be careful not to get caught. If you do, you’ll have no choice but to run. Your standard flashlight stuns them momentarily, but they will recover, and fast. There might be an add-on to your flashlight that could do more, but you’re going to have to upgrade first. Sentries: These towers scan the immediate area with a beam of light, tracking anything that falls into its scope of vision. Don’t be fooled, they hear extremely well on top of that, and will snap their vision to you if you make too much noise, and attack with a short, charged blast of energy (you can hear them charging them up in between shots). On top of this, there’s no way to defeat them with your flashlight. Instead, these turret style machines must have their power shut off at a nearby power switch, attached via a glowing red cable. They can be briefly distracted with a well-placed bottle throw, which can be found throughout the world, but you have to be fast. Christmas Trees: Similar to the Daleks, these are shorter, stationary machines. Unlike the Daleks, however, they can’t be defeated with the flashlight and must be similarly switched off like the Sentries. They also can’t be distracted by throwing bottles, as they attack on entry to their perimeter. Small balls of energy fly at you with seeking accuracy. Your best bet is that, once it catches on to you, to try and outrun the shots and hit the switch before it recharges them. You might still take a hit, but keeping on the move can keep you from taking several. The reason we’re out here in the first place is to search for upgrade components for our flashlight, and fuel for the mysterious machine in the center of our bunker. Think of components almost like a currency for The Light Keeps Us Safe, used to “buy” a new upgrade. We’ll also need quite a bit of other supplies in order to stay alive while we search, so knowing where to look is key. Pressing the F key (or whatever you choose to bind the interact key to) at any time will search the area with your senses, and reveal the locations of possible items, hidden away in the darkness, appearing as ? or ! marks in your immediate area. Dumpsters, cabinets, drawers, and more can hold necessary food, medicine, and bandages. Remembering games like Don’t Starve and Alien: Isolation can help kick in the right instincts here. These are just tools for keeping yourself alive, though, not the goal. 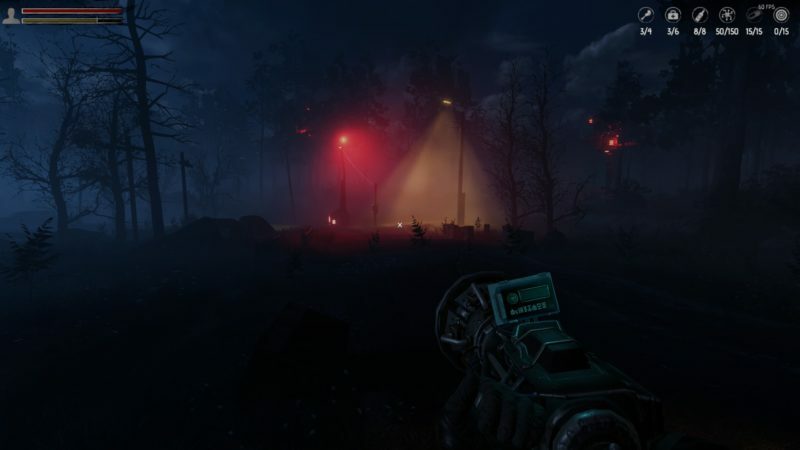 You’re hunting for components for your flashlight, which are necessary to upgrade it, and these are a rare commodity in the world, only located behind heavy security. The machines guard these behind layers of defenses, with bigger caches of components (stored away in glowing blue objects that look like a safe) even better guarded. Whenever you see a big cluster of machines and the glowing power lines surrounding a building, you know that there’s something worth grabbing inside. You’ll have to disable most if not all of the guarding machines, and then a barrier that covers the building’s entryway of course, but the rewards are worth it. Be aware that you aren’t safe once you’re indoors, however – trip wires are everywhere, and enemies like the Floating Eyes can pear in through windows to catch you off guard. Stay on your toes, this world wants you dead. On top of disabling security machines, there will often be puzzles associated with getting inside. Some require special flashlight upgrades, others careful searching for a hidden power source, and there can even be environmental hazards like pools of toxic chemicals. Point being, there’s often no straightforward way of getting to the components you need, and you’ll need to use everything at your disposal. For now, I think you’ll be set to at least try to survive in the darkness. This game is, as mentioned above, procedurally generated, and there’s no telling just what you’ll find out there. You’ll have to find your own ways to survive – but know that there’s far worse out there than what I’ve listed here. 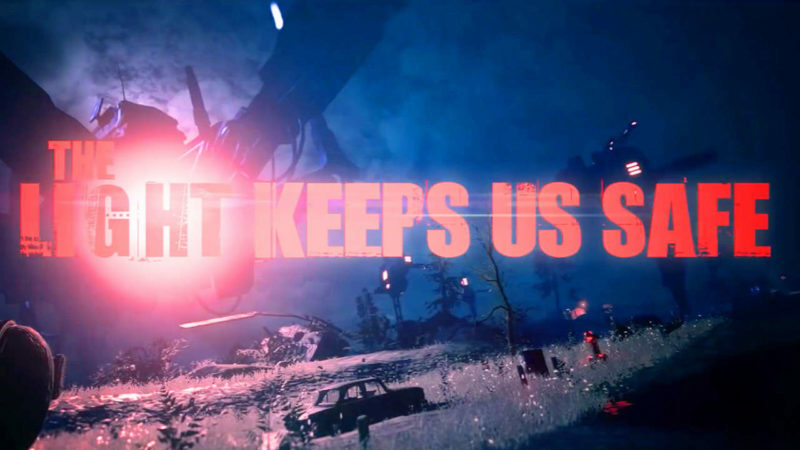 We’ll be playing The Light Keeps Us Safe soon enough on our Facebook and Twitch channels, so be on the lookout.